In this beautiful Journey of our life we meet many people , Some of them leave a great impact on our mind , some are there whom we love to follow and they become our Role Model . One such person whose story I would like to share is my Father – in – law, Mr. Abdul Ahad. Born and bought up in a small village in Bihar , he was much different from his siblings .He had the vision of importance of education for common man specially women education and empowerment. Unlike his other siblings he completed his studies including Master’s degree and got a job in TNB college Bhagalpur,Bihar.Later on he became the Principle of that college . 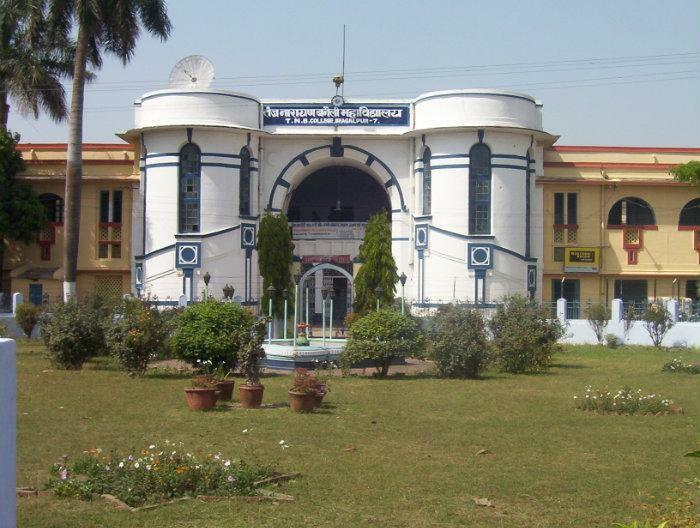 I am adding link to official site of TNB college Bhagalpur , where in the History of college , name of founders and all principle’s are given. One can read Mr.Abdul Ahad’s Name in 12th rank , He was principle of college from June 1961 to January 1962 . That time during 1960’s girls education was not given much importance , specially in Muslim families girls were not allowed to attend school and colleges , they use to get basic education at their home. But my father-in-law sent all his daughters to school and college for formal education.He did not cared what relatives and society is saying about him and his family.He believed that it is very important to give formal education to girls as it is the women who runs the household , teaches her kids , so its essential that they should be educated and if required they should also step out of their house and do a job , something which was not considered good that time in society . So he believed in Women Empowerment .Giving formal education , then Technical education and then a chance to prove their talent by doing a job.All his daughter were well educated , much more than the women of that time , the youngest one did MBBS and moved to USA for higher studies (after her marriage). So later on he became a role model for others specially in the Conservative Muslim Families that girls should be given a chance to prove their talent. He was also the Founder of URDU GIRLS HIGH SCHOOL , BHAGALPUR . He wanted girls to come out and study , since girls from minority community were not sent to government or private schools , he thought of opening an Urdu school where those girls can study and get basic education.The school was founded in the year 1969 and its still there at Jagdishpur , Bhagalpur . He loved his daughters more than his sons , which again was different from the inequality in the society where boys are given more preference than girls . On festivals he used to make clothes for his daughters first then for others . Thus taught others that girls should be given due respect and love from their parents family and everywhere. The other aspect of his nature which I would like to share is Employee Care . Since he was the principle of a famous college he took this as his responsibility that he has to take care of all his subordinates and provide them the best of every thing. He fought for the rights of class IV employees of his college . In the University meeting in Patna , he requested that the salary of Class IV employees should be increased , they should get Bonus once a year , They should get free uniform and Winter wear from College , since they were so poor that they can not afford to buy those things . It took some time but then the Bill was passed and not only in TNB college but in many other colleges in Bihar the salary of class IV employees was increased with bonus and uniform . So people use to give him blessings for this . Thus again he taught that we should have Human Touch with our employees when they serve us and do so much of hard work , its our responsibility to take care of their needs. People in Bhagalpur still remember his name and his college employees who are very old now still tell the tales of him that how he had fought for their rights . So he is a Man Who is Made of Great , who fought for the rights of others , For Women Empowerment and for Employees of various colleges in Bihar . One more thing which I would like to mention is his Strong Will Power and Trust on Almighty. Even in stressful situations he used to remain calm and had trust on Almighty and used to say that Everything would be All right . After his retirement he was not getting Pension from the college as at that time there was no pension scheme for college employees.Since he had a family to support and he was not very rich person , he took another job.At the age of 60 when people take rest , he started doing a job in college which was very far away from his home , but instead of getting disheartened he took this as a challenge and did that job . So he taught others How to find a way in any Situation , instead of complaining and crying its better to find a way. Thus all this had a great impact of me and I learned many good things from him and I am proud to be his Daughter-in-law. He was a simple man but his strong Will power made him extra ordinary , one who was Trust Worthy and Reliable , driven by Self Belief , and a Pioneer in bringing positive change in the society. I learned Self Belief from him. We have to have belief in ourselves then only we can rise . We have to create opportunities for ourselves . He used to say Rights are not served in a Plate , You have to Fight for it . And its true , sometimes we have to fight for our rights .That makes us more strong and confident. So my father-in-law is #madeofgreat. His honesty , sincerity , love for everyone , love for Almighty made him such a Great Person. I am writing this post in association with Tata Motors #madeofgreat campaign. Lionel Messi is global brand ambassador of Tata Motors . He is talented and icon for todays youth . And Tata Motor is a Brand which is Reliable ,Trustful and innovative. So association of Tata Motors and Lionel Messi is a great thing . What do you think of Tata Motors association with Lionel Messi ? The best comments can get an amazon.in voucher worth 750/-!! The last date to comment and win is 25th Nov.2015. So enjoy reading the post and do comment , waiting to read answers. Really outstanding heroic man and I sm really awed at his foresight. Salutes. I simply think that Tata's are all the more lucky to have found a gem of a person inLionel Messi to steer their extraordinary ship. A very nice write up Ghazala..
Tata Motors' association with Lionel Messi is #madeofgreat due to the Unity of two excellent Entities , marvelous Merits, Sports and Technology joint venture , merger of brilliant forces for the crowning glory of Sports and Auto Industry, The Superstars of Sports and Auto will dazzle and brighten the whole World. I like such stories of unsung heroes who have contributed so much to the society and yet have gone largely unnoticed simply because they never chased any Padma awards or like. A delightful read indeed on a great soul from my home state. Both Tata Motors and Lionel Messi inspire awe and respect by putting on display unmatched performances resplendent with a touch of class and finesse not witnessed elsewhere. Commendable job done by your father-in-law Ghazala and nicely written. Bringing to fore the stories of unsung heroes amongst us is a magic that occurs when excellence meets commitment-Tata Motors and Lionel Messi! Kudos to your father-in-law dear for the noteworthy job. Very beautifully penned. When determination meets excellence, there evolves the breathtaking collab of Messi and Tata Motors! Hats off to your FIL for contributing to the society to this level. Thank you for sharing these contribution of him with us. I salute to him. A reformer has gone unnoticed. Thanks Ghazala for introducing us to such a great soul. Born in an era when women were designated for kitchen and home care, he has made a revolution. He's indeed a great inspiration! I was moved when I heard about Messi's other side of having been selected as the goodwill ambassador by UNICEF for supporting lives of children across the globe. Tata Motors has brought several dreams of middle class citizens alive with their most affordable car in the world, Nano. Behind Nano's making, there was certainly a touch of humanity. I believe, with what drives them from within, as individuals, they are sure to create something great for the future of the world. Not to exaggerate, but Messi's words during the event, "Namaste India" has certainly rang a new moment in the history of India! The story of a Legend in himself – that’s how I will describe it in a short sentence. Very well written with words and pics which enhance the simplicity yet greatness of the Person. Salutations and very happy for you to have got inspired and bringing out your best in life. You can choose my answer as the Voucher winning comment if you feel I described it all well.. 🙂 Please remember to post it on the Indiblogger contest page today. Your father in law is truly an inspirational person! I am so glad to be acquainted with his work through your post. Very nice post dear! Wish you very good luck! Tata Motors' association with Lionel Messi is undoubtedly #madeofgreat! Tata Motors known as a maestro in Auto industry, and it's not any surprise that they would like to make bond with another maestro, iconic figure Messi! No one can say, it is just for publicity or a trick to attract a particular generation, by teamed with celeb branding; it is very natural and rightly to make a bond in two great – Tata Motors and Lionel Messi. And, if you ask me; I'm a fan of both, so it's perfectly #madeofgreat for me!